Sift together the flour, salt, sugar and baking powder into a large bowl, in a small bowl beat together 1/2 cup cream, egg and vanilla. Add the butter to the flour mixture using your hands or a pastry cutter, cut in the butter until mixture resembles fine breadcrumbs. Make a well in the center of the flour mixture, pour cream mixture in the well and with using your hand gently fold mixture together. Just when mixed together, turn out onto a floured surface, knead very gently only 3-4 times. Form into a circle and pat gently to about 1 inch thick, using a 3 inch round biscuit/cookie cutter cut out scones, you will get about 8 scones. Or you can cut the circle into 8 wedges. Brush scones with extra cream, and place onto a baking sheet, bake at 375 degrees for 15 minutes, risen and golden. 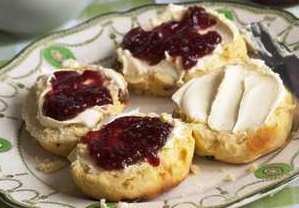 Serve with English clotted cream or English Double Devon Cream and fruit preserves. I’ve made these several times and they always turn out so yummy and they are so so easy and simple….A must try for breakfast or afternoon tea! !